Congratulations to Hotel Omm, the Murmuri Hotel, Hotel Àbac and the Mandarin Oriental for winning the first FAD Certification of Design Quality Award. 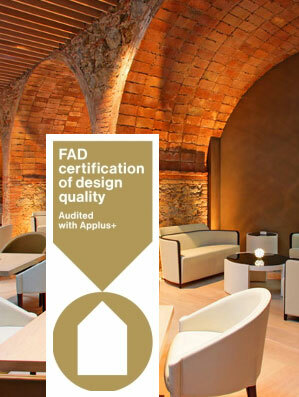 And congrats to the FAD and Applus for initiating the recognition of design in the hotel world in Barcelona. “The incorporation of design by hotel establishments leads to greater user satisfaction and contributes to an increase in the number of clients. Design is influential when choosing (choice at source) and a determining factor in client satisfaction (experience at destination). It is in this context that the FAD Certification of Design Quality has been created. This is a seal of quality that has the objective of fostering the use of design as a means to improving people’s quality of life and environment within the framework of hotel establishments.